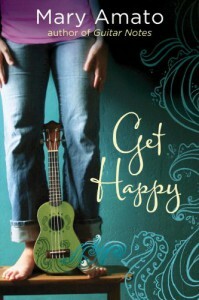 Reading Get Happy actually made me extremely happy. I have never laughed so much reading a book in my life. It was so lighthearted and hilarious. Mary Amato wrote a story that captures what it is like to be a teenager, without making the main character unlikeable. Actually, I loved Minerva. She is honest, funny, sarcastic and insecure. She reminded me so much of myself when I was a teenager. I was shocked at how good this book was. It wasn't exactly the storyline, but it was the writing that really made this book phenomenal. This book really cheered me up and I wish I could personally thank Mary Amato for that. I'm disappointed that it's over and I need to check out Guitar Notes by Mary Amato.